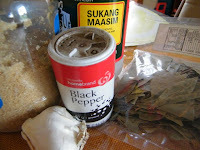 Adobong Puti is so-called because it does not have the characteristic dark colouring of adobo as a result of soy sauce. Indeed, this version is noted for the absence of soy sauce, with white vinegar as the main flavouring agent. As a result, this is a sour version of adobo which you can balance with a hint of sweetness using brown sugar. This dish is best served after many hours, preferably overnight. We had some of it for dinner right after I cooked it and it strongly reminded me of paksiw. In fact, I was wondering if this white abodo is paksiw all along. But when we had it for lunch the following day, the vinegar had substantially mellowed out and the flavours 'marinated' into the pork pieces, and it was good. It is indeed adobo, but different! PS This is different from the white adobo version where patis (fish sauce) is used. Others though say that version is called pinatisan and not adobo. Intriguing. Might try that too some other time. 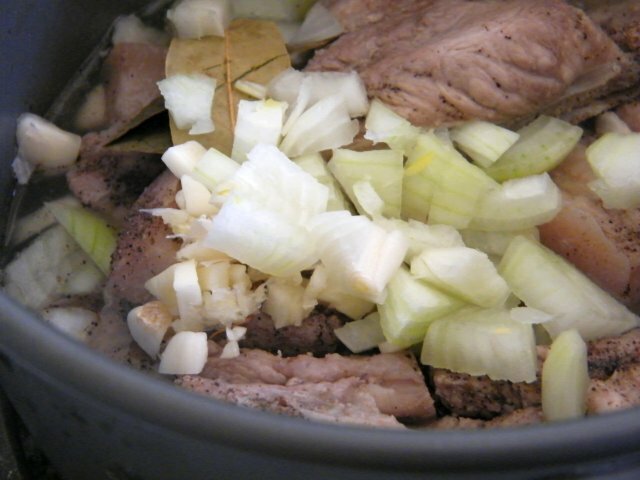 Place pork in a pot and pour enough water to submerge. Cover and bring to a boil. 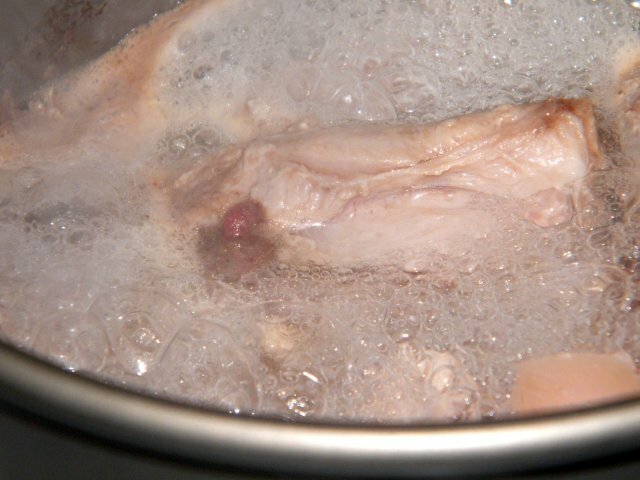 After 10 minutes of boiling, drain off the water. Add 1 cup water and all the other ingredients into the pot. Cover and bring to a boil, then lower the heat to simmer. Continue cooking until pork is tender (20-30 minutes should do it). Taste the vinegar sauce at this point. If it is too sour for you, you may adjust the taste by adding brown sugar. As recommended, keep overnight and serve the next day reheated. 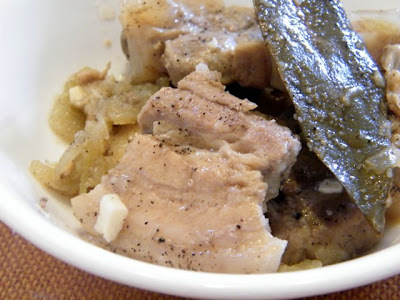 The "pinatisang baboy" I have tried was with kamatis. As with any Pinoy food. It was nice with hot rice. I've never tried cooking adobong puti, ever. Pwede namang di pork liempo di ba? Or is this the best part to cook? @Elmer: I'm curious how that tastes like! @Clair: Pata is also a recommended part. I think that for as long as it's those parts that become tender and have some amount of fat in it, will be good for adobo. I've cooked adobong puti using pork, pork + chicken, or beef. I do not recommend cooking chicken alone. I'll probably post the recipe I use on my G+ stream. I hope to try this adobong puti on my next cooking. Yes, it is somewhat similar to pinatisan. My nanay always cook this pinatisan using pork knuckles.